How to download Honor 8 Nougat EMUI 5.0 B360 full upgrade package and install it? 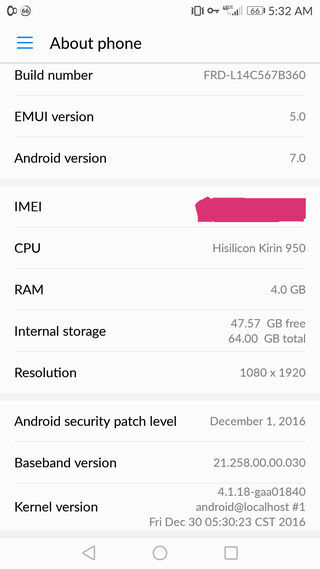 Leave a Comment on How to download Honor 8 Nougat EMUI 5.0 B360 full upgrade package and install it? The Honor 8 EMUI 5.0 firmware update has been released based on the Android 7.0 Nougat. We have already reported about the Honor 8 Beta version of Nougat and the Marshmallow upgrade packages. Now, Huawei is officially rolling out the Nougat firmware upgrade to the Honor 8 and many of of its variants including FRD-L09, FRD-L14, FRD-L19. The new firmware brings the build number FRD-L09C185B360. One of the major feature about the B360 firmware is the EMUI 5.0 UI. It also brings low resolution power saving mode, December 1, 2016 Security patch level from AOSP, and a new Kernel version 4.1.18-gaa01840 (Friday Dec 30 05:30:23 CST 2016). 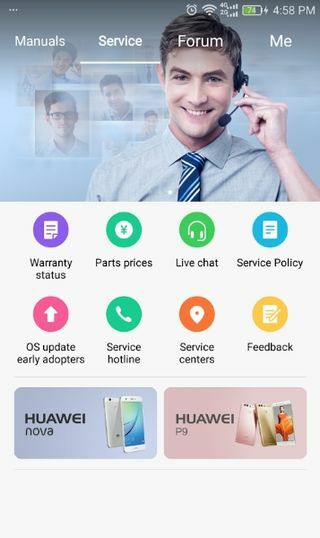 You can download the OTA easily from the Huawei Finder application. However, a simple OTA package of 1.38 GB may not work and cause trouble in upgrading from Android 6.0 to 7.0 N. You will need the full upgrade package of 2.38 GB. 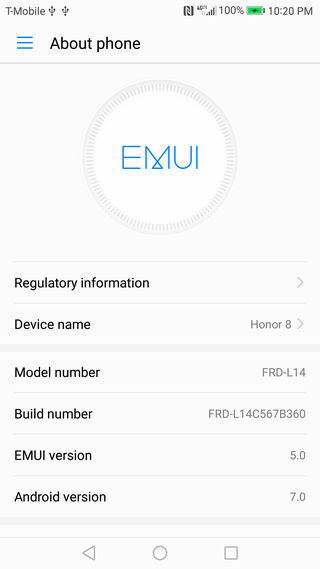 There are 2 methods to download and upgrade any Huawei device including Honor 8 to EMUI 5.0 safely. First one is using the Huawei’s very own HiCare app and the second is using the Huawei Finder app by setting up a Proxy server. Checkout the methods below. Download and install the official Huawei version of the HiCare app. Choose the option ‘OS Update early adopters’. If there is no such option, you can find the option at Me > Settings >Location and choose another location and try again. Check again in the OS update option and see if there is a notification of a new update. If available, accept and follow the instructions. Once that is done, check the update app and you should receive a notification to upgrade. Method 2: How to download and update to the latest EMUI firmware on Huawei devices? 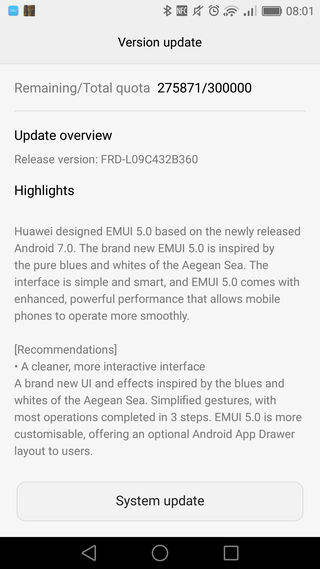 If the above procedure doesn’t works and other Huawei device are receiving a particular update across the world, for instance the EMUI 5.0 based on Nougat, that means the OTA is not live in your particular region. If that’s the case, you can manually upgrade your Android device using the Huawei Finder app for Android as well as PC. 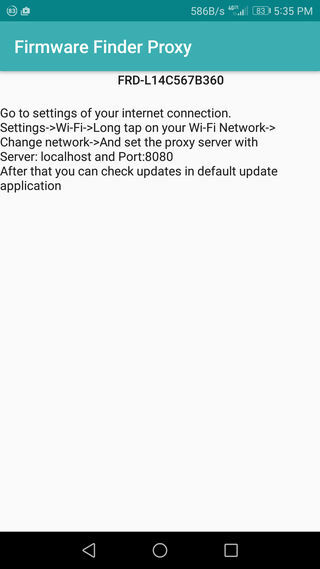 The following guide uses Android app to update my phone from stock Marshmallow to Nougat using the proxy server option. This method may not work on office or secure networks and certainly not using a VPN. You may connect your devices on your WiFi router or create a WiFi hotspot. Launch the app and click on settings. 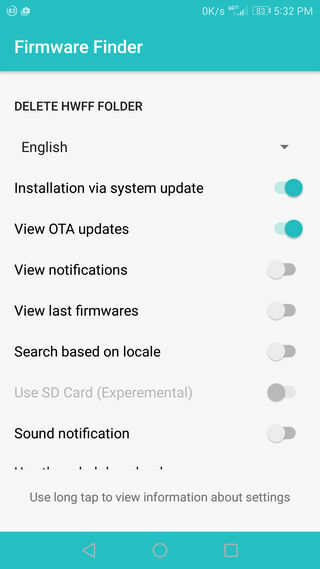 Enable “Installation via system update” and “Via OTA updates”. 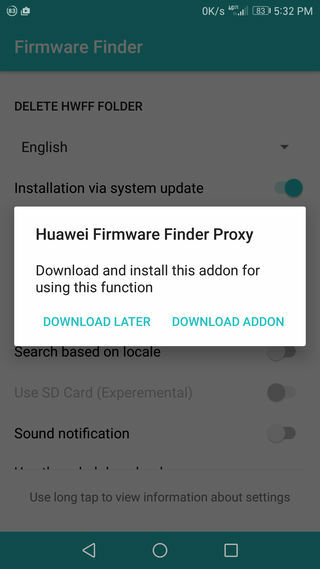 Download the Huawei Firmware Finder Proxy app which will be prompted. Install it. 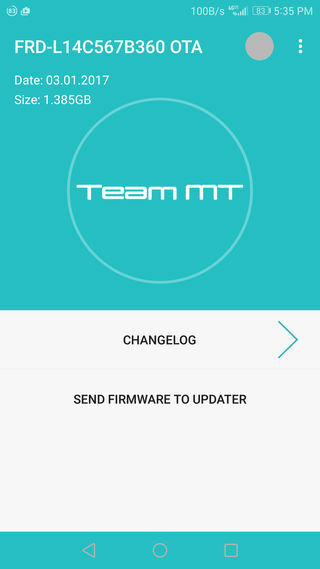 Open the main app window and click on “Get firmware list” and choose the appropriate update from the list. Click on the “Quick update” button. Wait for a while to see this option. Go back to the WiFi setting and turn on proxy setting to “None” again. Now reconnect to WiFi. Now you can pause and resume the Updater. Download the full package and install it. Better choose the “Download latest full update package” once you get the upgrade notification from the phone’s System update to make it work. However, clicking on “Check for Updates” might work as well.